It consists of two bars; one with six handpumps and the other with twelve. It's in a Z shape internally, with two entrances. There is a mixture of normal tables and chairs and high stools and tables, but the majority of the seating is at normal tables. There are some outside seats separated from the pavement by a fence at one of the entrances. bob visited on a Wednesday evening in September 2016. The pub was quite full of people, but there were still lots of tables to choose from. 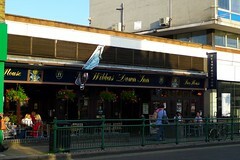 There were twelve real ales on, all priced between £2.05 and £3.09: Wimbledon SW19, Moles Gold, By The Horns Mick the Miller, Summerskills First Light, Sambrook's Pale Ale, Ringwood Forty Niner, Sharp's Doom Bar, Wychwood Hobgoblin, Greene King IPA, Abbot Ale, and two others. A couple more (Tillingbourne AONB and Truman's Runner) were marked as "coming soon". bob's pint of Mick the Miller was adequate but not great. According to the pub's Twitter profile as of August 2016, food is served all day until 11pm. Accessibility: Step-free at both entrances, and level to the toilets, including an accessible toilet. There is one raised seating area with a step up. Last visited by bob, September 2016. Opening hours taken from the Wetherspoons website, August 2016. Last edited 2017-09-15 18:32:38 (version 4; diff). List all versions. Page last edited 2017-09-15 18:32:38 (version 4).